A birthday is far more than a day that marks the day you were born and another year older on the calendar. It is a celebration of your life and as such deserves far more than just a run of the mill cake and mundane party. This same concept should be taken into account whenever you are planning a birthday party. Here at Wedding Sparklers Outlet, we have put together a few birthday party ideas to help get you started. No one ever said an adult birthday party has to be dull and boring. If you are planning a birthday party for an adult, why not do something out of the ordinary and turn the celebration into a wine tasting party. Buy several whites, reds, and blends, birthday party glasses and just to brighten up the event, add some of our bottle top sparklers to each new bottle of wine as you present it for the first time? Oh my, are birthday candles every passé in this modern era! But this doesn't necessarily mean you can't light up the cake, no matter how young or old the celebrant happens to be. Our cake sparklers are sure to thrill when the guest of honor and for that matter the rest of the guests see the birthday cake covered in a glowing shower of golden sparks. The sparks are harmless, food-safe, and will not stain the table cloths. 4. What About a Barbecue? Everyone loves a good barbecue, why not plan to incorporate one into the next birthday party you plan to host. For kids you can do hotdogs, hamburgers, and wings, for the adults, you could serve the same or maybe go all out and serve steak. Once the meal is over and dusk begins to settle, you can hand everyone sparklers to go out in the yard and have fun showering each other with sparks and writing letters in the air. 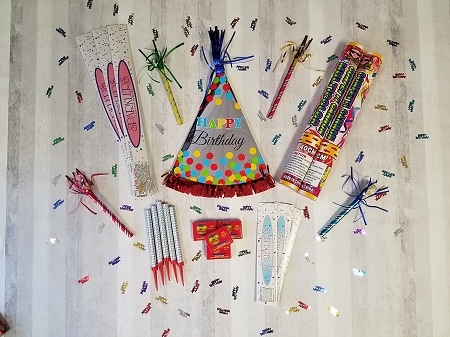 One last thing you can do to add a little more fun to the party and the last of our suggestions for planning a birthday party is to make sure everyone has at least one if not more of our multi colored confetti cannons. While everyone is singing "Happy Birthday" to the guest of honor, they can all shower the person with a massive cloud of colored confetti. The confetti is biodegradable, so if your party is outside, you can let the rain dissolve them or use the hose to clean up after the party is over.